Could you please provide a brief rundown of what DSC does and what role you serve? 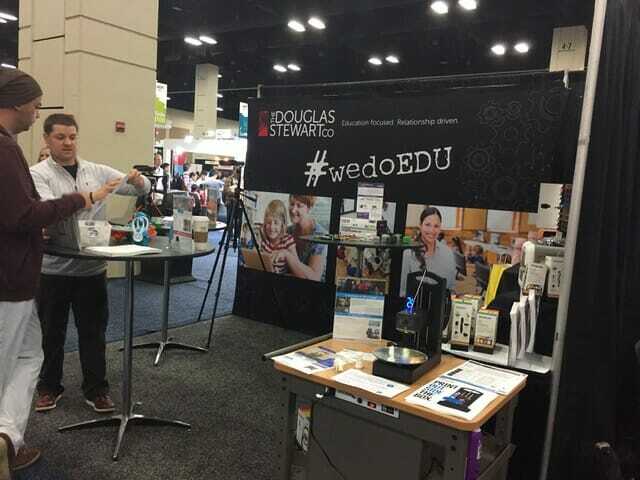 The Douglas Stewart Company is a leading distributor and business service provider for the higher education and K-12 markets, working closely with our customer network of over 4,000 on-campus bookstores and value-added resellers. My role as Business Unit Manager for the VAR (value-added reseller) segment is focused on utilizing our knowledge of the K-12 market to drive growth for our partners. Is there any vetting process for which products DSC agree to sell? Yes, we evaluate potential partnerships based on several factors. First, is there a clear value proposition to the market? Does a vendor provide a unique solution to the end-user, whether a teacher, tech director or a library/media specialist? Second, is there sustainability to their model? Is the solution an ongoing resource for the user, is there curriculum to support it? Successful implementation of a classroom tool needs to go beyond a ‘one and done’ approach; schools need technology to support them throughout their journey, not at just one stop along the way. Are the vendors listening to the needs of the market, and the real problems that need to be addressed? This brings me to the last point, which is evaluating if it is simply a product or a partnership opportunity for us, for our resellers, and ultimately, for the schools being served. Is the vendor willing and able to understand the needs of the district and the goals within their organization? Are they focused on building channel partnerships and working with resellers to serve schools? It is essential for us to look beyond the product to see the potential. How do you decide which products to sell to a given institution, company, or school district? Primarily this is driven by the resellers in tandem with the vendors, both of whom are nurturing relationships with the districts to better understand the organization and their specific needs. We can learn a great deal from the personalized learning approach educational technology is embracing. Let’s look at similar districts in size, student population, goals, and their experiences with this tech in-field and work with the customer to adjust for their specific use case. This applies to everything from charging carts to single-sign on software. Currently, where are you seeing the most growth? Growth for our company within the K-12 segment, is focused on the mobile learning and makerspace categories. 1:1 and BYOD [Bring Your Own Device] initiatives continue not only to drive demand for devices but also all the surrounding peripherals, from software to headphones. The emphasis on project-based learning and how students come to deeper understandings through a trial and error process have forged a path for adoption of tools such as 3D printers, robotics and video production within makerspaces. We expect implementation of makerspaces in all of their various forms to increase dramatically within the next couple of years. We recently conducted an interview with Christopher Nyren, who runs Educated Ventures, an investment firm that focuses on education technology. He described to us how the main drivers of technology and edtech development in the U.S. (centered around New York and Silicon Valley) haven’t been particularly effective at catering their technology to education’s needs. Do you agree with Nyren’s assessment? Rather than agree or disagree, our perspective maintains that best practices involve following a market-driven model. Is the company an ed-tech company, or a tech company trying to fit in education? Do they have a team focused on the segment, conducting pilots, analyzing use cases, finding true solutions for actual problems? Are they aware of and tracking current legislation to see how it affects their potential customers from a budget perspective as well as how funding for their product is affected in turn? And, as with any approach to developing a business, is there a focus on partnership? One of the best examples of embracing this approach is the work we did with LocknCharge in assisting their market development efforts in the US several years ago. Their CEO, who is Australian, spent a significant amount of time in the US, connecting with schools to learn about real challenges they were experiencing with device deployment and then taking that knowledge back to have their team build better products. Simultaneously he worked with the reseller channel to develop the business with them, harnessing the power of an amazing network of sales reps that know the education market.